Government intervention is a pervasive structural characteristic of all industries and markets. The form and nature of that intervention takes varying forms. Bankruptcy, environmental, financial, health & safety, incorporation, labour and protection of persons & property are just some of the areas in which Government plays an active role in every industry. I will first argue that equity provides both the legal and economic rationale for governmental intervention. I will then highlight non-market forces unleashed by certain forms of governmental intervention, specifically price setting. The economic concept of Equity evolved out of a distinct strand of English legal history. Together with the Common Law, Equity emerged during the reign of Henry II (1133 –1189). Those interested in the legal origins of Equity, please see Observation # 3: Equity. The Common Law is concerned with right and wrong, guilt or innocence. Equity is concerned with fairness. Economic concepts of Equity derive from legal Equity. Thus the Chancellor of the Exchequer (in Canada called ‘the Minister of Finance’) exercised concurrent jurisdiction in Equity with the Lord Chancellor’s Court. There are two economic definitions of Equity, each reflecting its historical roots. First, there is Equity as the financial capital of a limited liability corporation which, after deducting liabilities to outsiders, belongs to the shareholders. Hence shares in a limited liability corporation are known as equities. This links back to the historical development of trusts under Equity. Second, there is Equity as ‘fairness’. While usually used with reference to taxation it is a general economic concept. With respect to taxation Equity has three dimensions: horizontal, vertical and overall. Horizontal Equity refers to ‘like treatment of like’. Vertical refers to ‘unlike treatment of unlike’. Overall Equity refers to the accumulated impact of all forms of taxation. Crudely, it is the difference between earned and disposable income, i.e., income net of all taxes – income, excise, sales, et al. Equity is also used to justify market intervention by Government, e.g., minimum wage and rent control. Equity thus provides the legal and economic rational for government intervention in the economy. Such interventions include, of course, the Corporations Act and Bankruptcy Act. It also justifies anti-trust and anti-combines legislation to counter the exercise of Market Power. We have seen that if a competitive market is allowed to operate an equilibrium price/quantity outcome will result from the interplay of market force. 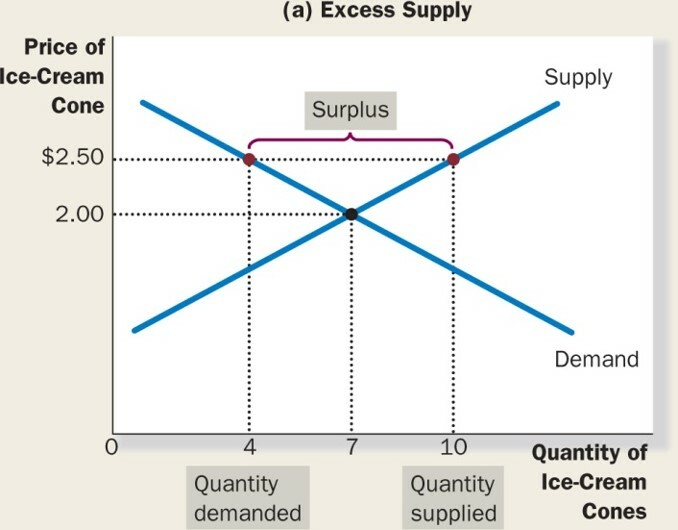 If price is too high, Supply exceeds Demand and a surplus is created. To get rid of the surplus producers must lower their price, eventually to equilibrium. 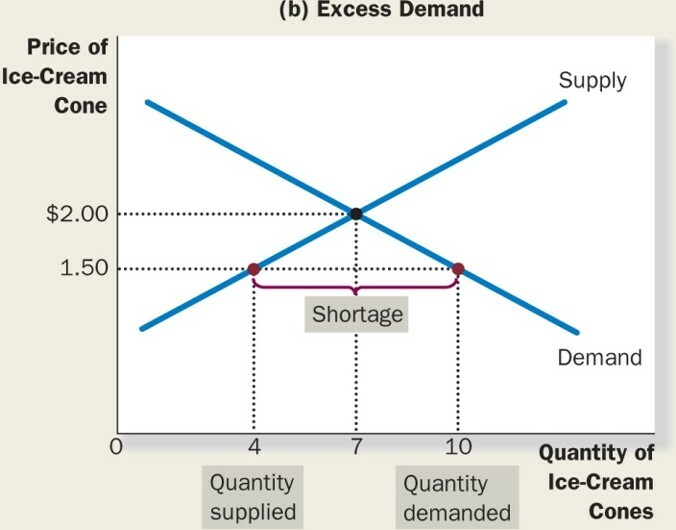 Similarly, if price is below equilibrium then Demand exceeds Supply and a shortage is created. 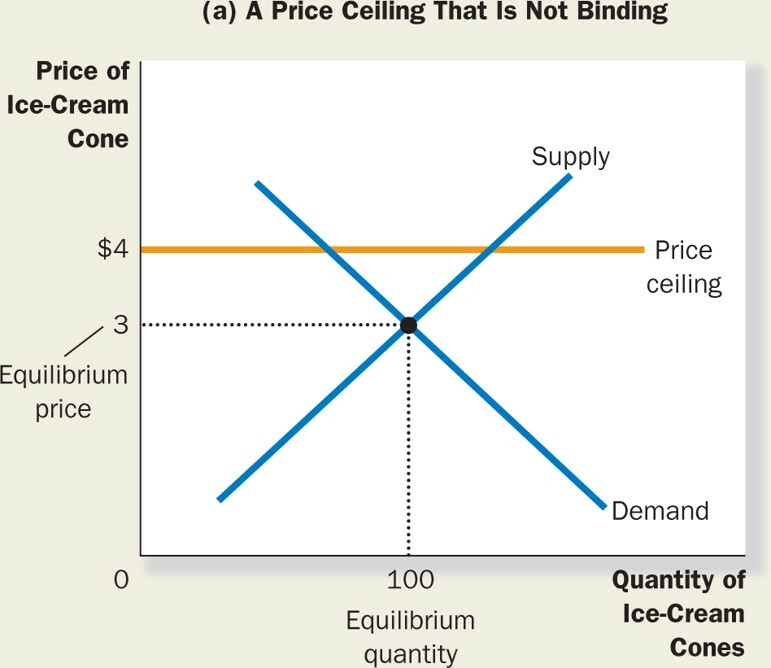 Consumers wanting the good bid up its price back to equilibrium (P&B 7th Ed Fig. 3.7; MKM Fig's 4.9 a & b). What happens, however, if Government intervenes and does not allow market forces to function? I will now consider such price setting intervention in agriculture, housing, labour, prohibited goods and taxation. Agriculture is subject to significant fluctuations in supply yet a relatively inelastic demand, people have to eat. We begin by assuming only domestic production is involved. In any given year, the supply is fixed and perfectly inelastic, a harvest is the harvest is the harvest. In an unregulated market (P&B 4th Ed. Fig. 7.11), a bad harvest shifts supply to the left. This raises prices and will actually increase revenue to the farmer. A bumper crop, on the other hand, will shift supply to the right, lower prices and reduce farm income. Many agricultural commodities can be stored, that is placed in inventory. Inventories serve to stabilize prices between growing seasons. Without inventories the above situation applies, that is a good harvest lowers prices, a bad harvest raises prices. 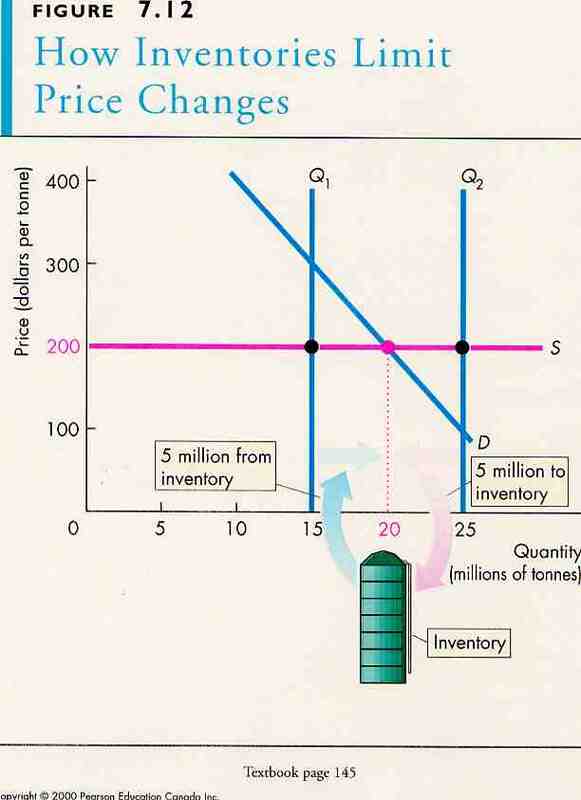 Inventories reduce these price fluctuations (P&B 4th Ed. Fig. 7.12). A good harvest can be used to increase inventories, that is, not all output goes to market and price decreases are moderated. In the case of a bad harvest, inventories are sold, thereby increasing supply and reducing price increases. A price floor acts like a minimum wage. If the floor is less than market equilibrium, it has no effect. 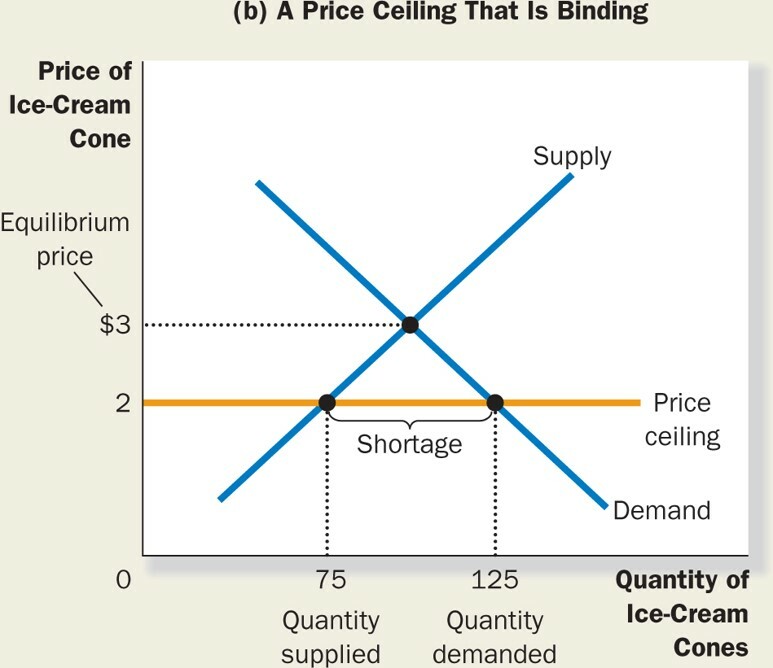 If it is greater than equilibrium price it will create a demand gap between the larger amount suppliers are willing to provide at the floor price, and the quantity consumers are willing to buy (P&B 4th Ed. Fig. 7.13; R&L 13th 5-2; MKM Fig. 6.4 a & b). 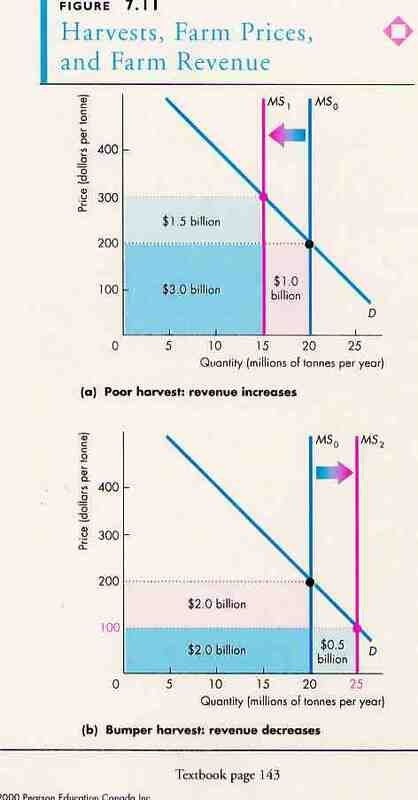 Subsidies act like a reverse tax (P&B 7th Ed Fig. 6.12). 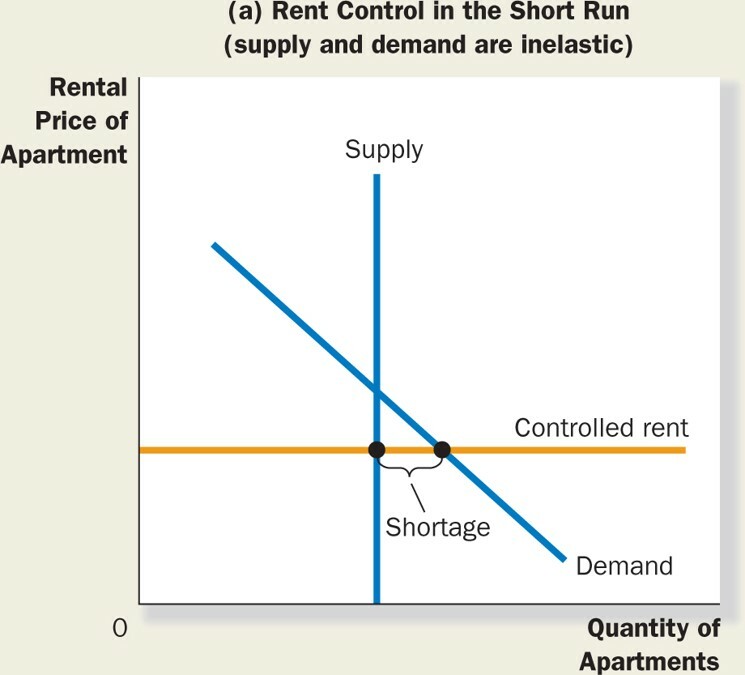 The tend to shift the supply curve to the right. Output increases and prices fall. Such 'supply-side' subsidies financially reward increased production by offering subsidies per bushel of output or per acre planted. This approach has led to a frightening subsidy spiral. 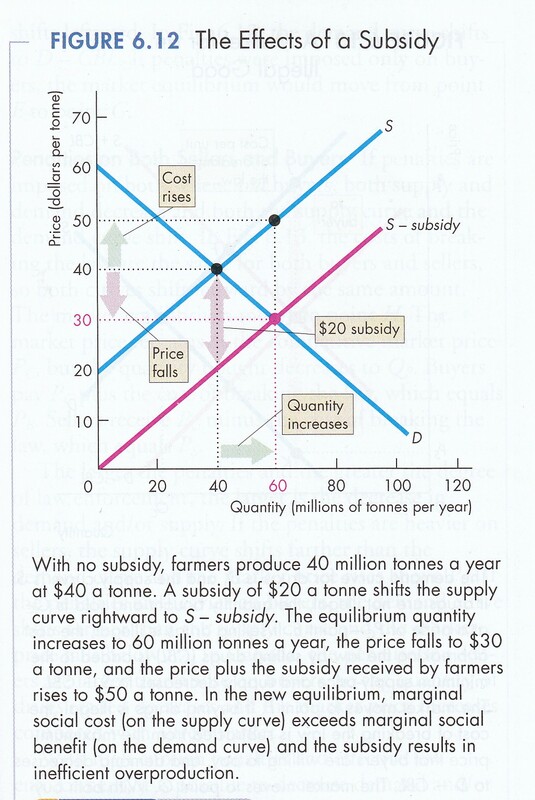 In effect, production subsidies reduce the final price of farm output below the cost of production. This, in turn, means that even efficient farmers cannot earn enough to maintain operations. This, in turn, leads to more subsidies that lower prices further. And, so on and so on and so on... For a different approach please see my "Putting Culture Back into Agriculture"
It must be noted, however, the graphics hide the costs of enforcement of government intervention in agricultural markets but also all of the following interventions in housing, labour, prohibited goods and even taxation. Such enforcement costs are paid usually not by consumers or producers but rather by taxpayers. Part of the short-run adjustment process involves price, that is, if demand exceeds supply, prices will tend to rise. In the case of rental property, which tends to be the type of housing available to the poorer members of a community, a price rise takes the form of rent increases. 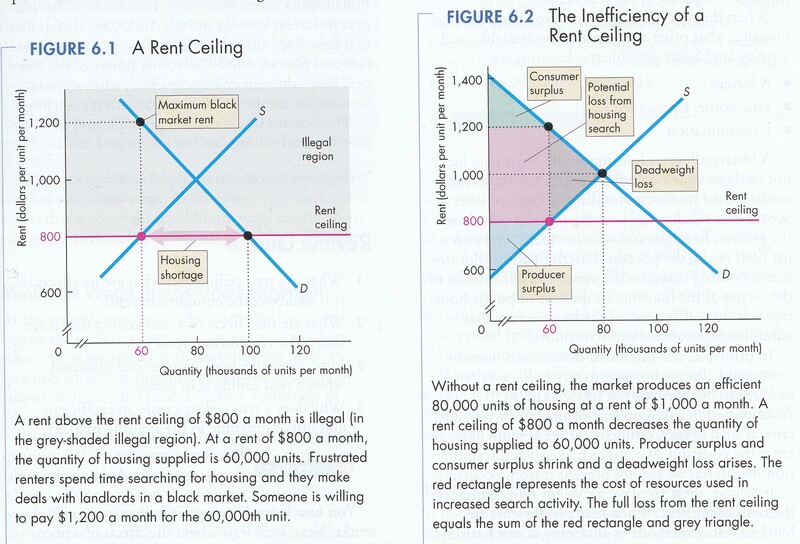 If government decides for reasons of vertical equity (unlike treatment of persons in unlike situations) that the poor need to be protected from rent increases (or for political reasons, there are more poor voters than landowners) then it may impose rent controls in the form of a rent ceiling (P&B 7th Ed Fig. 6.1 & Fig. 6.2;. R&L 13th 5-3 & 5-4; MKM Fig's 6.3 a & b). b) consumers will 'bribe' supplier, for example, by paying more 'on the side'; by accepting little or no maintenance or support services; by accepting 'run down conditions'. 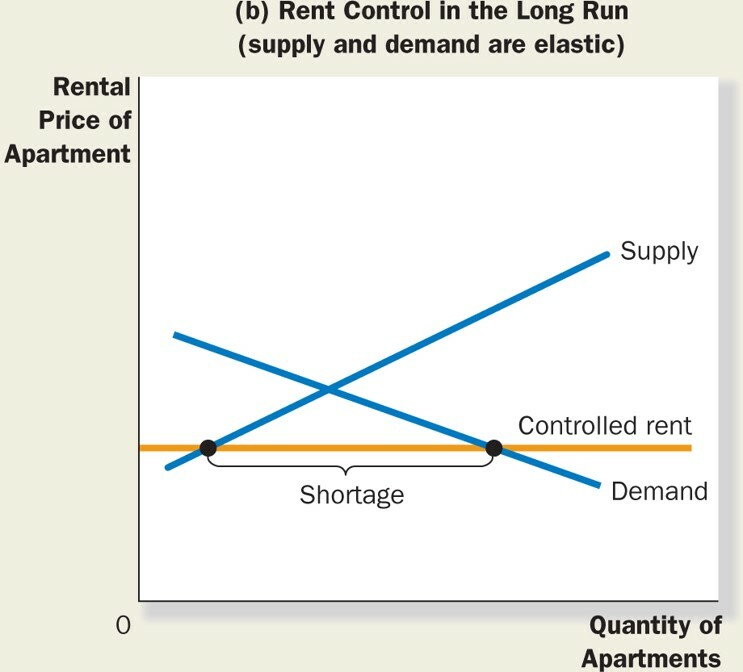 The effect of rent control is to reduce the return to suppliers. If they cannot cut back production directly they may do so indirectly. First, new rental accommodation will not be built which, if population continues to grow, accentuates the shortage. Second, existing rental property will be allowed to 'run down', eventually into 'slum condition'. With excess demand and a fixed price, the supplier can recoup his or her opportunity cost by running the building down until it is uninhabitable, then tear it down and build private homes or condos for sale on an open and competitive market without price controls. This again accentuates the housing shortage. 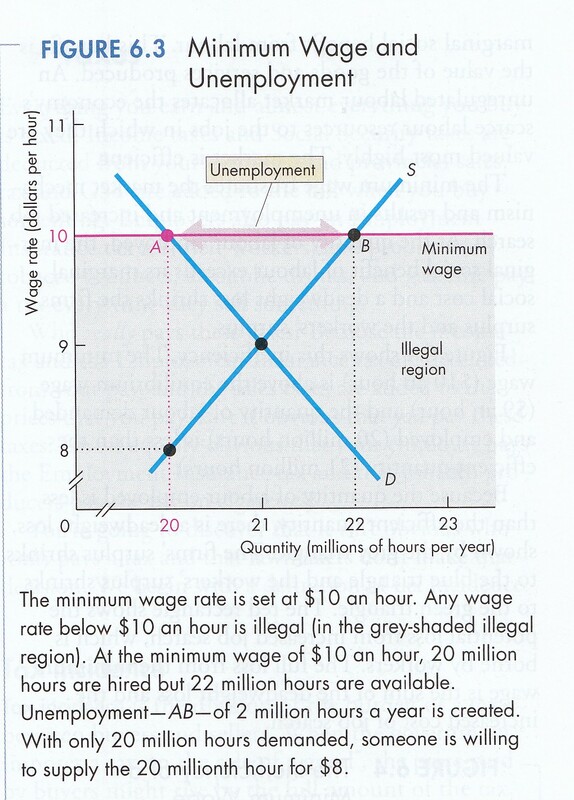 Low wages for unskilled labour may create a question of vertical equity (or political reasons). Government may decide that with such low wages unskilled workers cannot support themselves, their children and/or other dependents above the 'poverty line'. Accordingly government may intervene by establishing a 'minimum wage rate'. If this rate is below market equilibrium rate such a minimum has no real effect. 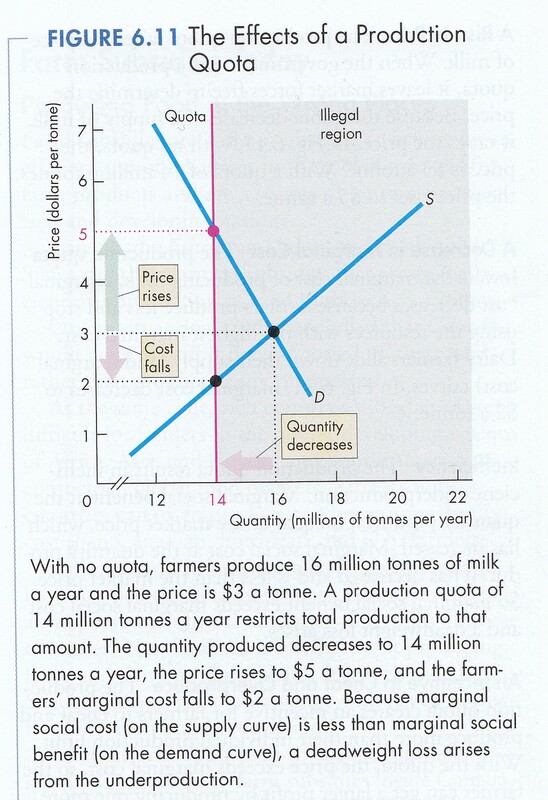 If, however, it is above the market equilibrium price (P&B 7th Ed Fig. 6.3 & Fig. 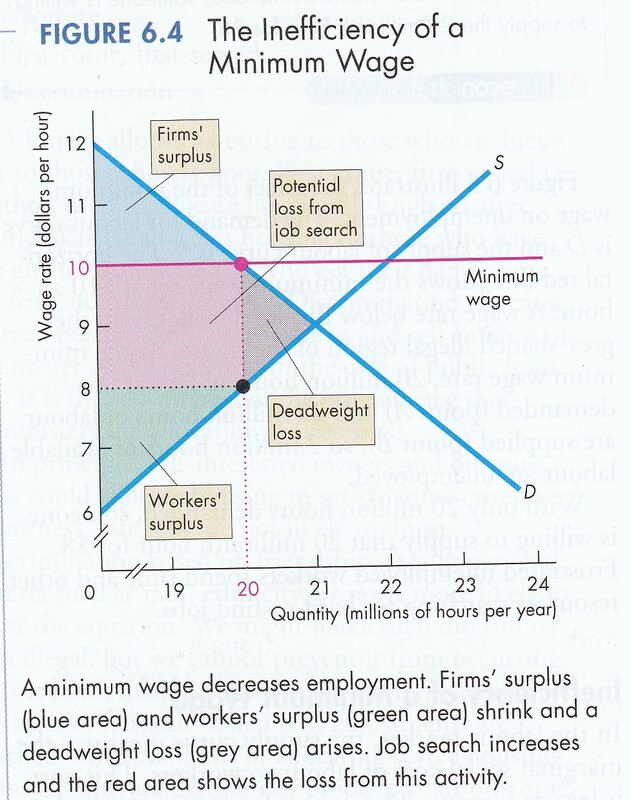 6.4; MKM Fig's 6.1 a & b) the supply of willing workers exceeds the demand of producers. As in the case of rent controls, if the price cannot adjust, other forms of behaviour will evolve. For example, some workers will offer to work some hours 'off the books'. While some goods like recreational drugs are illegal and hence prohibited, a market exist. 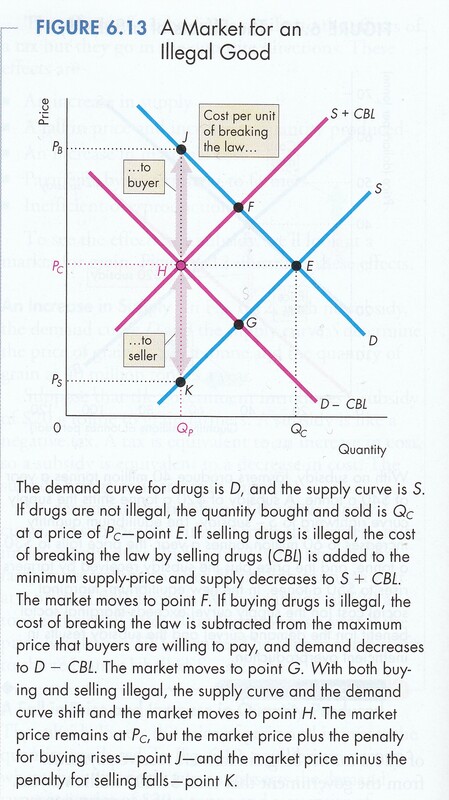 To understand the effect of prohibition, we begin with market equilibrium assuming no prohibition (P&B 7th Ed Fig. 6.13; R&L 13th 5-3; MKM Fig's 5.9 a & b). 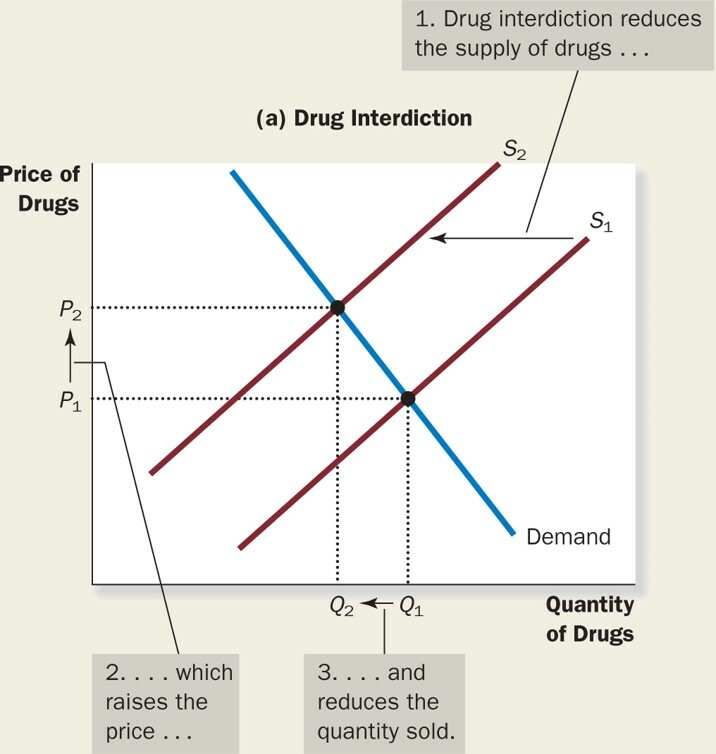 A prohibition affect both demand and supply. It imposes penalties, that is costs, on both. 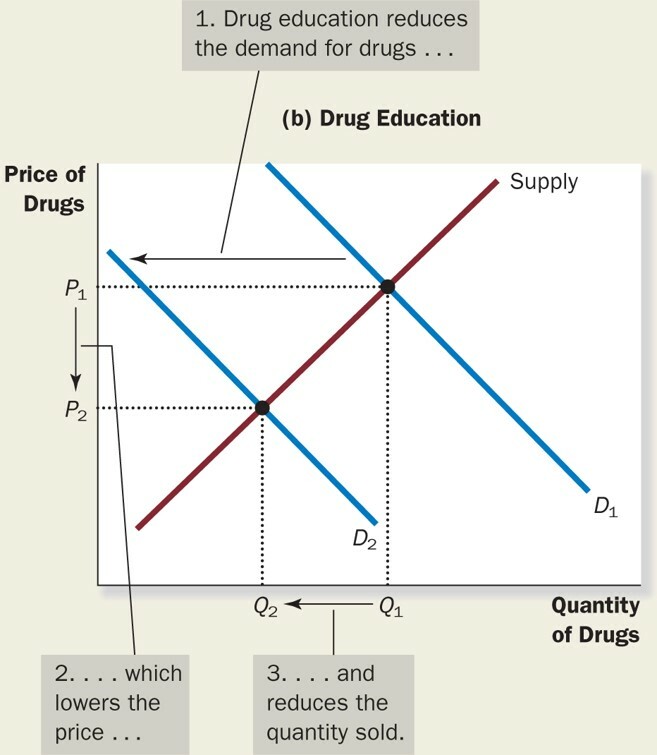 The effect is to shift the supply curve up to the left and shift the demand curve down to the left. To finance public spending (a pleasure), government must raise revenue through taxes (a pain). This pleasure/pain of public finance is described in the Introduction: The Pleasure & Pain of Public Finance to my paper "A Radical Analysis of 'Personal' Taxation." An increasingly important source of tax revenue is sales tax, for example, the GST and provincial sales tax. The question arises: who pays Is it the consumer or the producer or both? Consumer demand does not change if a sales tax is imposed. 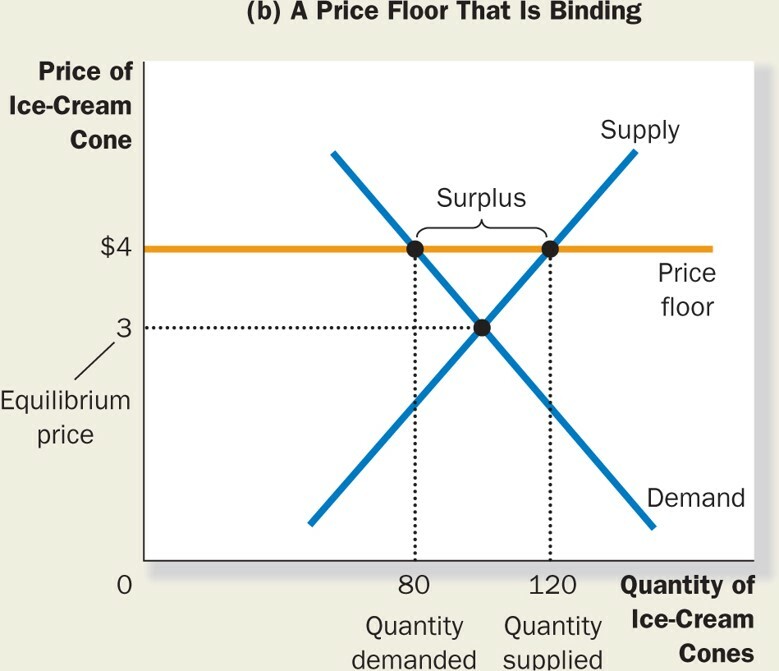 The demand curve reflects the quantity of a good or service consumers are willing to buy at a given price. 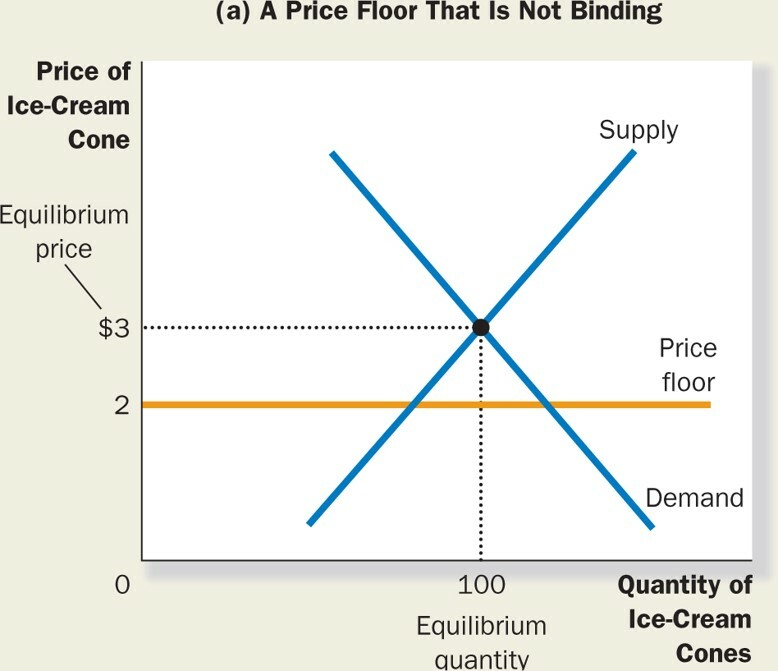 If the price goes up, one slides up the demand curve; if the price goes down, one slides down the demand curve - all things being equal. Accordingly, to the consumer the real price of a good is its retail price plus any associated taxes. 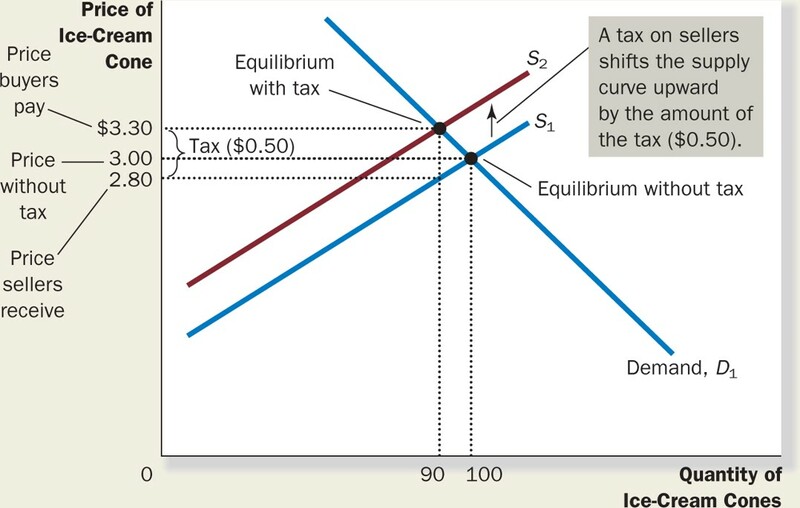 A sales tax does, however, shift the supply curve up to the left. Producers are willing to supply a certain quantity of goods or services if the receive a given price. 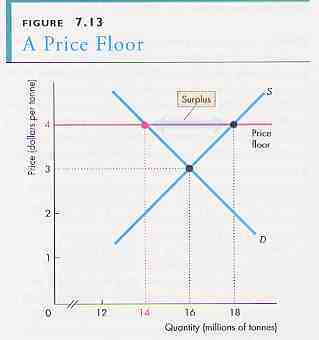 With sales tax, such goods and services are offered for sale at a higher price (P&B 7th Ed Fig. 6.5; R&L 13th Ed Fig. 4-8 & 4-9). 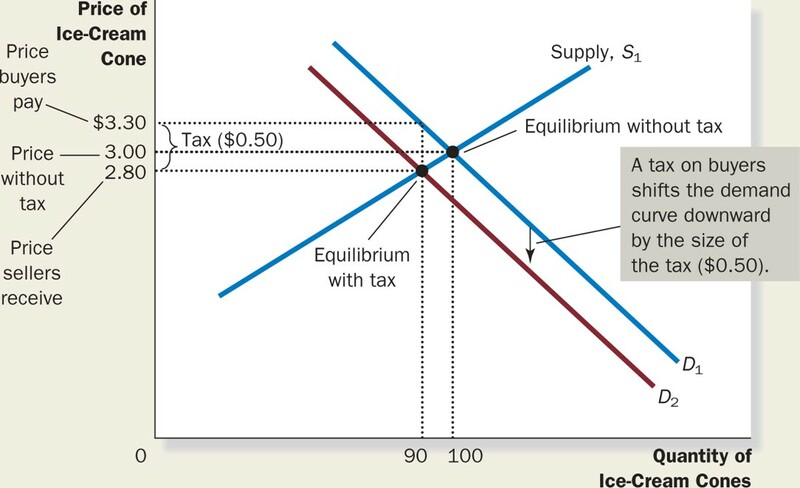 The supply curve shifts and a new equilibrium is established at a higher price and a lower quantity than before the tax. 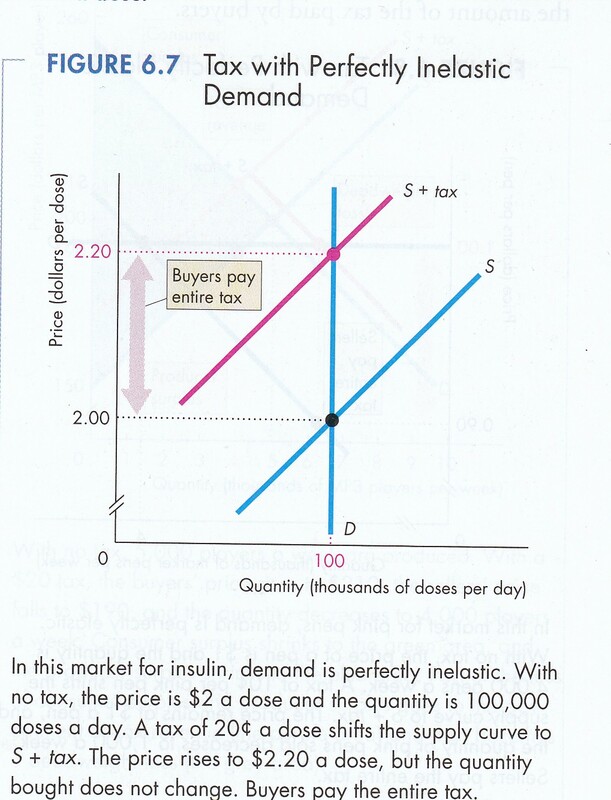 As to who pays the tax, the answer depends on the elasticity of supply and demand. 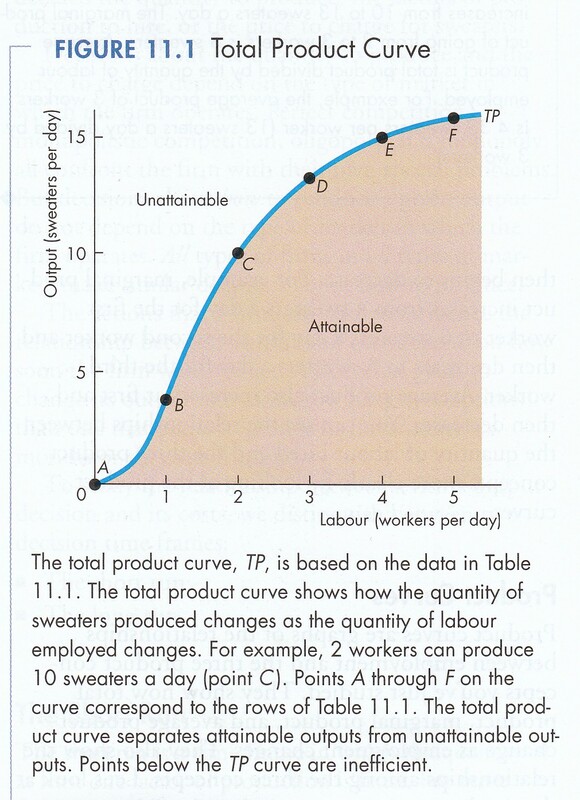 If there is perfectly inelastic demand, for example for a 'necessity', the demand curve is vertical (P&B 4th Ed. Fig. 7.7a; 7th Ed Fig. 6.7; MKM Fig. 6.6) In this case the consumer pays the full tax. If, on the other hand, demand is perfectly elastic ((P&B 4th Ed. Fig. 7.7b; 5th Ed. Fig. 6.7; 7th Ed Fig. 6.8; R&L 13th Ed Fig. 4-8 & 4-9; MKM Fig.6.7), then the producer pays the whole tax. 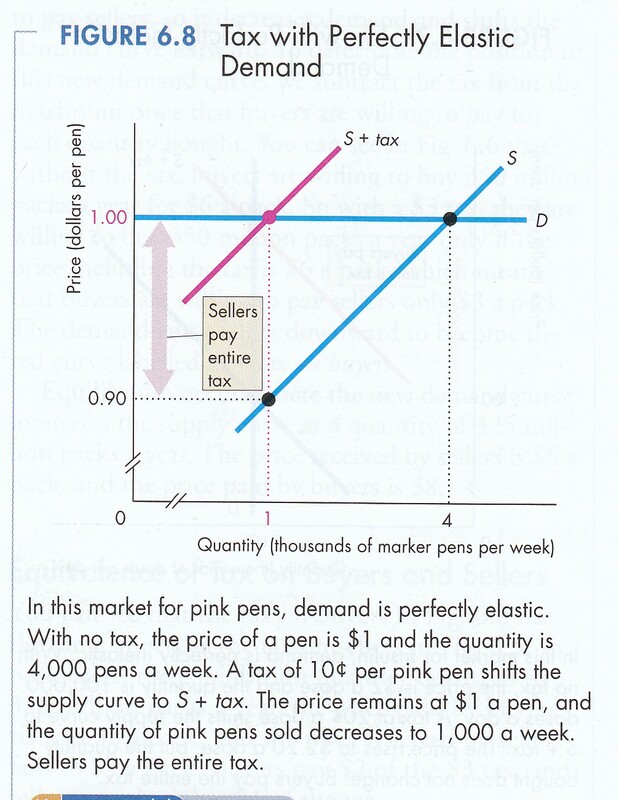 In the case of supply elasticity, the situation is reversed (P&B 7th Ed Fig. 6.9a & b). 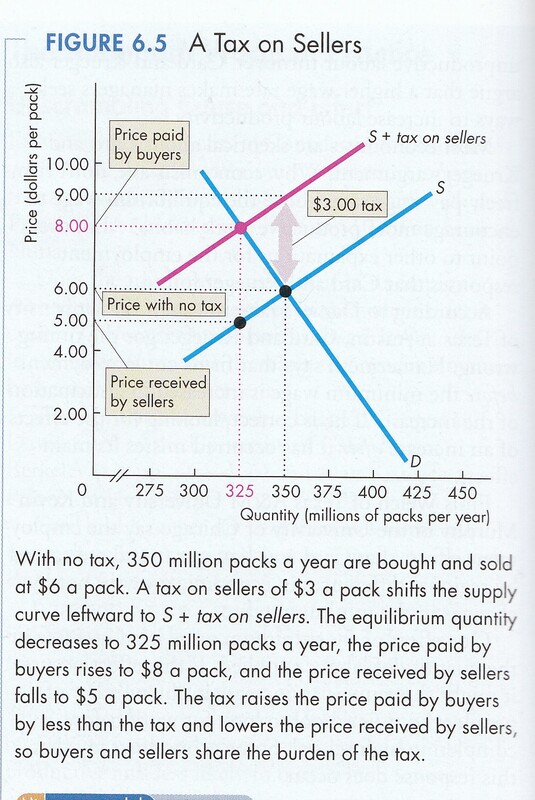 If supply is totally inelastic, that is the supply curve is vertical, then the supplier bares the full tax. 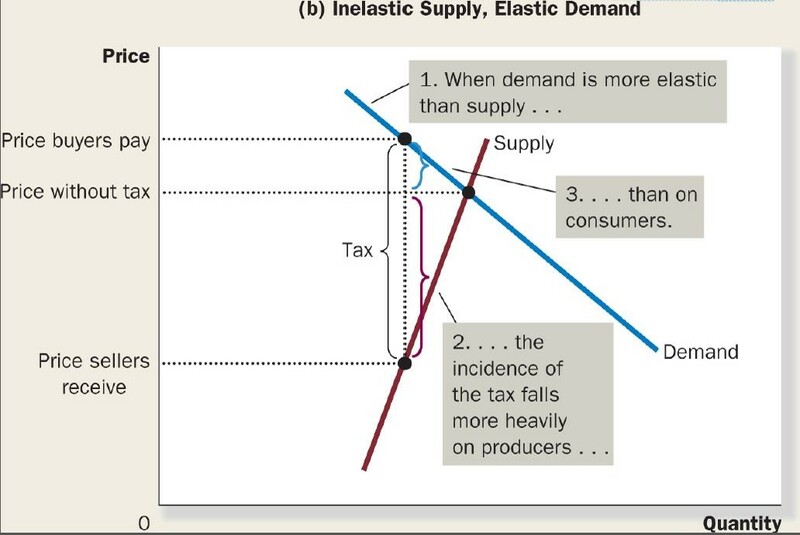 If supply is perfectly elastic, however, the consumer will pay the tax.